It’s hard to imagine the level of ignorance — or downright cruelty — which would result in letting a pony’s feet to grow into curlicue horns. It’s likely his feet hadn’t been trimmed in a decade. That’s right, 10 years. Poly’s feet were so long he could barely walk off the trailer. Vets estimate his hooves hadn’t been trimmed in 10 years. 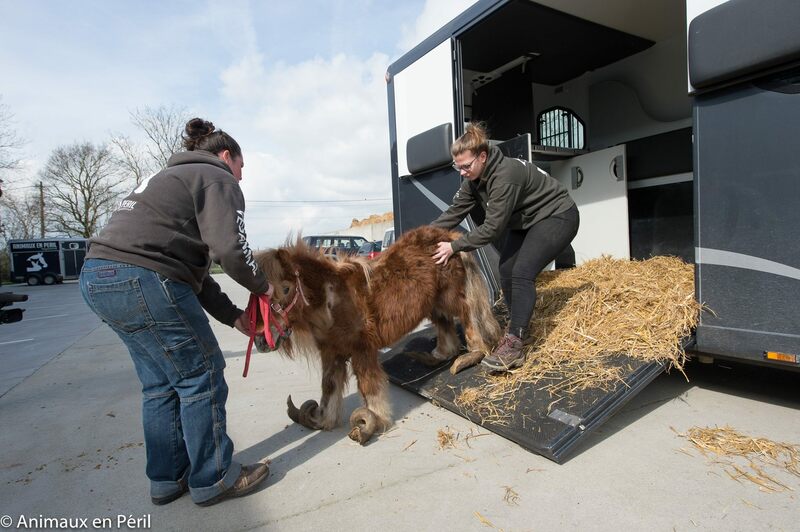 Poly and a horse, now named Everest, were kept out of sight from the public until their owner turned them into the Animaux en Péril sanctuary in Belgium. They were found severely emaciated and standing in nearly two feet of manure. 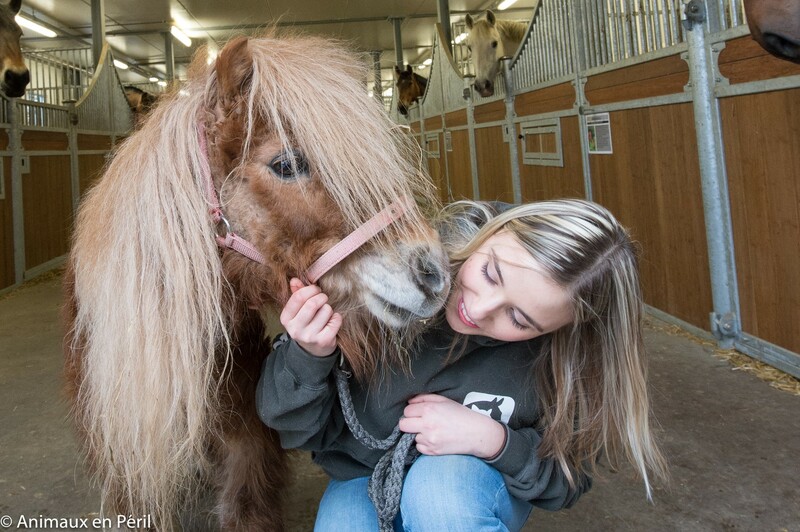 Poly weighed only 154 pounds — a far cry from the 450 pounds of a normal Shetland pony. The farrier had to saw through Poly’s overgrown hooves. 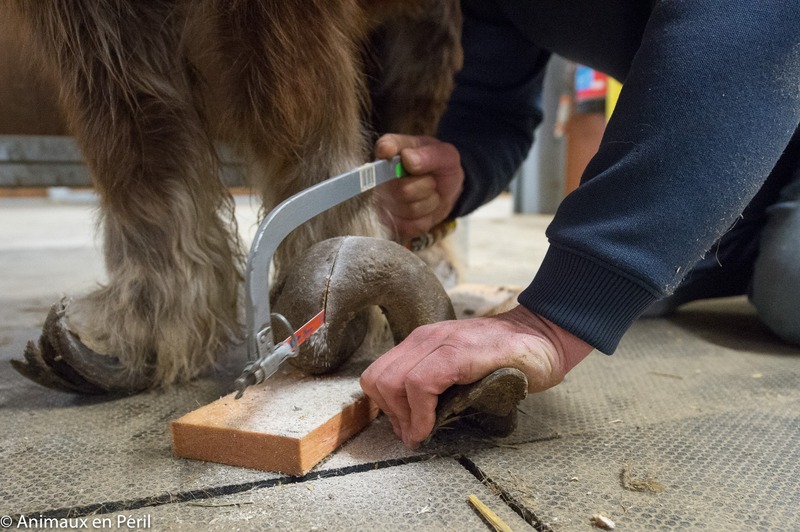 Once there, Poly and Everest were bathed and body clipped, then Poly’s hooves were treated by a farrier, who had to saw through the overgrown horn. Just the weight of the hooves was enough to cause the pony distress. Although Poly’s feet are much better, he may never overcome the damage that was done to his joints. Although severely mistreated by the humans in his life, the sanctuary reports that Poly is a gently soul who continues to trust his caretakers. Poly and his friend Everest were extremely lucky to have found refuge. Please consider making a donation to the sanctuary.